A fun and cute game aimed at children between the ages of 2 and 5. 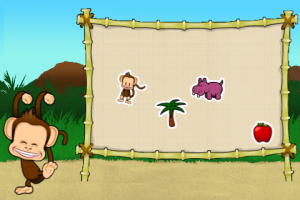 Help the monkey count, match, differentiate colors and letters, as well as helping the monkey solve puzzles that will teach shapes and pattern recognition. 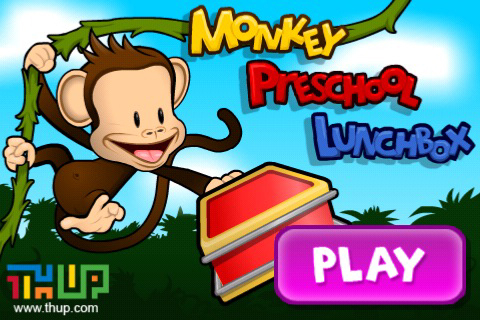 The entire game revolves around the monkey's lunchbox and fruit. Think of this one as a cross between Sesame Street and a Disney cartoon and what you'll get is Monkey Preschool Lunchbox. The game features five different games, each one teaching something a bit different. 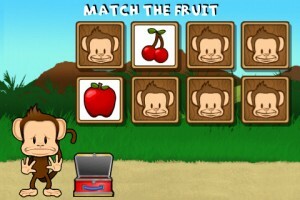 There is a color game where the goal is to only tap the same colored fruit. Like if the color is green you'd pick a watermelon or kiwi, etc. The next game is a matching one where you have eight different cards to pick from. Out of the eight, there are two matching pictures on each one. Turn them over one at a time and find all of the matching pairs. The counting game is just that, counting. 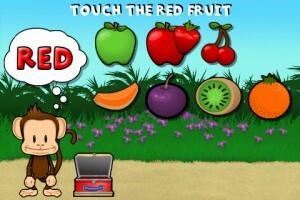 You must tap the amount of fruit the monkey is asking for, etc. 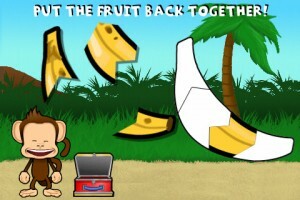 In the letter game the monkey wants fruit starting with a certain letter and you must only tap the fruit that corresponds with whatever letter is chosen. The last game is a puzzle game where you must simply put the pieces of a puzzle together. Each puzzle is a picture of, what else, fruit. The game also rewards each completed level with a sticker. You get to choose one and place it anywhere on the board. If you are looking for a fun and entertaining way for your child to learn basic math, letter and pattern recognition, this is a great way to do that. This app looks great, plays extremely well, and is just plain fun. The sounds and animations are really well done here. The monkey is very cute and any child will no doubt find this little monkey silly and enjoyable to watch as well as learn from. The best learning games are the ones that basically make you forget you are learning because they are so much fun. This app is no exception to that rule. This is a great looking and sounding game, no doubt there. It is also a great way to get your child to learn the basics of language, patterns, and math. However, it can get a bit redundant at times so just be aware of that fact before you buy.